Many poeple has visited Nakayama Hokekyo-ji Temple since it was built. On this page, some of them are introduced; Koetsu Honami the artist in early Edo Period, Socho the Renga-shi (linked-verse poet), Shiki Masaoka the haiku poet in Meiji era, Kafu Nagai living in Ichikawa and so on. In their works, Hokekyo-ji in the ages are drawn in their words. Nakayama Hokekyo-ji has four framed letters written by Koetsu Honami, the famous calligrapher and artist in early Edo period. 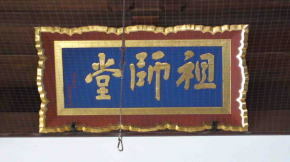 They are hanged on the Soshi-do hall, the Hokke-do hall, the Nio-mon hall and the Taikyaku-den (the main hall). And there is the hall for his family's tombs and his tomb. They are all designated by Ichikawa city as the tangible cultural property. Koetsu was given the land in Takagamine in north Kyoto in 1615 by Ieyasu Tokugawa, the first Shogun of Edo Shogunate, then he created the art village there with his family and his followers together. Kiyonobu Honami, the grandfather of Koetsu served the sixth Shogun of Muramachi Bakufu (Shogunate) as the distinguished sword appraiser. When he was put in jail as he had follen into disgrace with the Shogun, he met the venerable Nisshin there. Kiyonobu was powerfully impressed with his teaching, and he became a faithful believer of Nichiren Sect. 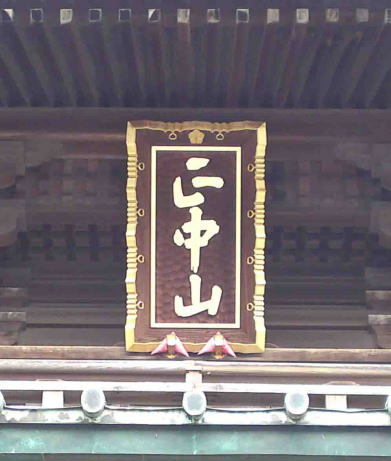 After he had been freed, Kiyonobu took tonsure and was given his Buddhist name 'Honko' by Nisshin, and he became the influential supporter of Honpouji Temple in Kyoto. Socho, the renga-shi (the linked-verse poet or renga poet) talked about Nakayama Hokekyo-ji Temple in his book 'Azuma-ji no tsuto', he wrote, 'I went across the Mama-no-tsugihashi bridge, and I stayed Hokekyo-ji Temple for a night. On next morning, they wanted me to compose a poem, then I composed a hakku (the start verse of a linked-verse poem). The storm was strong last night, but it is very mild weather today, it feels like the creek in Katsushika in spring. Socho was a renga-shi (a linked-verse poet) from Shimada in Suruga-no-kuni (Shimada city in Sizuoka prefecture) in Muromachi period. He was a son of a blacksmith, his name was Choroku in his childhood. First he named 'Sokan' by himself, and his pseudonym was Choa, Saiokuken. He entered the school of Sogi, one of the greatest rengashi in Muramachi period, and served him for forty years, and he often went on trips with his master. Socho wrote 'Minase Sangin Hyakuin' with his master Sogi and Shohaku (a fomous rengashi) is very famous. When Sogi was sick in bed on his journey to Echigo (Niigata prefecture), Socho visited him from his home Suruga and went to Hakone (Kanagawa prefecture). He attended his master's deathbed, and wrote 'Sogi Shuen ki' (The Record Of Sogi's End; 1502). Later he lived in seclusion at Saiokuken in Maruko in Suruga-no-kuni, he went on trips to Western, eastern, and northern regions, and he wrote 'Azuma-ji no tsuto' in 1509. He remained his diaries 'Socho Nikki' (1530-1531) and 'Socho Shuki' (1523-1528). He had visited Ikkyu, the abbot of Daitoku-ji Temple in Kyoto who was one of the famous and popular priest in Japan, he enjoyed making witty and polished Kyokas (satrical poems) and haikai poetry with him. His works are 'Ameyo-no-ki' (1519), 'Renga-hikyo-syu', 'Kabe-kusa' of poems (1512), 'Nachikago' (1517), 'Oimimi' (1522-26)., etc. One day in fall in 1896, Shiki Masaoka visited Nakayama Hokekyo-ji Temple when he suffered spinal caries. And he remained several poems in his books. Shiki Masaoka is a poet in Meiji era from Matsuyama city in Ehime prefecture. His name is Tsunenori, so Shiki was his pseudonym. His aother pseudonym is Takeno Satobito, Dassai Shoya Shujin (the owner of Dassai Book Store). He dropped out the facility of letters in the University Of Tokyo in 1892 and he started working at the newspaper 'Nippon'. During working at 'Nippon', he begun the movement of haiku poetry innovation campaign, and 'Dassai Shoya Haiwa' started to be serialized. He wrote 'Bunkai Yatsuatari' (1893) and 'Haikai Taiyo' (1895). After he wrote 'Utayomi-ni Atauru Sho'(1898), he founded 'Negishi-Tanka-Kai' (the group of writing poem at Negishi Tokyo) to try his best to innovate Tanka poetry. He expressed that Haiku and Tanka should be the literature based on the reality. 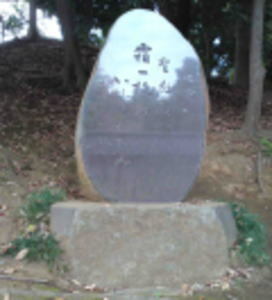 He raised many poets, Meisetsu Naito, Koroku Sato, Hekigoto Kawahigasi and Kyoshi Takahama were Haiku poets, Hotsuma Katori, Fumoto Oka, Sachiyo Ito and Takashi Nagatsuka were Tanka poets. He published 'Hototogisu' to renew Haiku, it later became the Hototogisu group, so he built up the basic movement of the group and another one 'Araragi' group. His works were a book of haikku poems 'Kanzan-Rakuboku', a book of tanka poems 'Takenosatouta', his essay 'Bokuju Itteki' (1902),'Byosho Rokusyaku' (1902), his diary 'Gyoga Manroku' (1902) etc,. In an essay 'Nakayama Dera' written by Kyoshi Takahama, a famous writer from Meiji to Showa, describes a lot about Nakayama, Yawata and Ichikawa in 1897. At that time he was 24 years old, and he was not interested in much about Nakayama Hokekyoji Temple. But he went to the temple since he might be urged by Shiki Masaoka who was his teacher and a great poet in his age, so Kyoshi wrote in the essay that Shiki had loved Nichiren. Kyoshi Takahama got on Sobu Tetsudo Line (now called Sobu Line) had opened in 1893 at Honjo Station in Tokyo and got off at Nakayama Station (now Shimousa Nakayama Station), then he visited Nakayama Hokekyoji Temple. At the temple, Kyoshi sat at Soshido Hall and he was lost in thought. He wrote that his ideal residence could be not in urban area but not far from it. He thought it at Nakayama, it supposed to be that Kyoshi would praise Nakayama could have a comfortable environment to live. After that Kyoshi walked to Yawata and saw Yawata no Yabushirazu and Senbon Icho in Katsushika Hachimangu Shrine. It is very interesting that the trees lined along the approach road of the shrine had changed, he wrote they were pine trees, but now they are gingko trees. And he misunderstood that the symbolic tree in the shrine would be a huge hackberry, but it is the huge gingko tree in real. Moreover, young writer Kyoshi decided to walk to home in Tokyo instead of waiting for the next train for a half and an hour at Ichikawa Station, he called Edogawa River 'Tonegawa River' while he was crossing it. Kyoshi Takahama was a haiku poet and writer from Meiji to Showa. His name was Kiyoshi Takahama. His home town was Ehime prefecture the same as his teacher Shiki Masaoka. Kyoshi became a leading haiku poet of 'Hototogisu' after the death of Shiki. He valued form, seasonal words and objective sketching of subjective feelings on his writing, and he insisted that the ideology of making haiku poems could be pure and natural without any preconceptions. He contributed diffusing haiku poems and training young haiku poets. He wrote many essays and novels, 'Keito (cockscomb)', 'Haikaishi (haikai creators)', and 'Kaki Futatsu (the two persimmons) ' are his novels. Dakotsu Iida, Kusatao Nakamura, Shuoushi Mizuhara, Teijo Nakamura and so forth were his disciples. In 1937, Kyoshi Takahama was appointed to the member of Japan Art Academy and in 1954 he was awarded The Order of Culture. Anyway, in the volume 8th in the complete works of Kyoshi Takahama, his essay 'Nakayamadera' describes his visit in Nakayama Hokekyoji Temple. (...it's a pair in shucked tenpura. 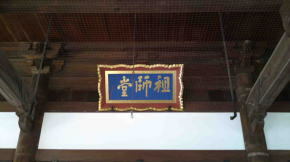 When I visited at the ceremony for the founder Nichiren at Nakayama Hokekyo-ji Temple, both ? and mixed tempuras were great, I had looked at them beside the Akamon Gate. Rokuu Saito lived in Ichikawa city Ciba prefecture as he escaped from dunning. Ryokuu Saito was a story writer, reviewer and a esseyist from Kanbe in Ise-no-kuni (Mie prefecture). His name was Ken Saito, and other pseudonyms were Midori Koto and Shotaro Shojiki (Goodman of Honesty). First he studied law, later he studied under Robun Kanagaki and he studied literature. He was famous for his polished critics, especially his reviews 'Shosetsu Hsshu' criticized Shoyo Tsubouchi, Simei Futabatei, Koyo Ozaki and so on in the literary satirically circles at that time came into the spotlight. Thereafter he discovered and established his own style of writing with severe satires. He was the story writer who stood on the line between Edo and Modern literacy, his works were the novel 'Abura Jigoku' (1891), 'Kakurenbo'(1891; Hide And SEEK), and the essay 'Seigan Hakuto' (1900), etc,. Kafu Nagai moved to Ichikawa city in January 1946, and he walked on Ichikawa almost everyday. According to his diary 'Danchotei Nichijo', there are many lines he talked about the specific views in the city at that time. In those lines, he talked about Nakayam area several times when he frequentely went to Kaijin in Funabashi city where next to Nakayama. He of course wrote Hokekyo-ji. There are several words 'walk on Nakayam' in the diary. October 31 1946, Kafu walked to Nakayama at noon. October 16, 17 1947, he visited Nakayama Hokekyo-ji to see the ceremony for the founder Nichiren's anniversary, those days, many visitors came, so it was very crowded. Kafu Nagai was a novelist born in Tokyo and died at Icikawa city. His name was Sokichi, another pseudonym was the owner of Danchotei, therefore his diary entitled 'Danchotei Nichijo'. He dropped out Tokyo-Kosho Huzoku-Gakko (the Hitotsubashi University and Tokyo University Of Foreign Study), and he studied under Ryuro Hirotsu. He had got influenced by the French novelist Emile Zola, he published 'Jigoku-no-hana' (1902; the flowers in hell) to attempt introducing Zola-ism to Japan. Kafu went to the United States in 1903, then went to France 1908. After he was back, he won fame by his work 'America Monogatari' (1908; the story of America). Next, he issued 'France Monogatari' (1909; the story of France), 'Fukagawa-no-uta' (the songs of Fukagawa), 'Sumida-gawa' (Sumida river), 'Reisho' (smiling with cold feelings). He played the important role of the anti-naturalism with his unique critics and his esthetic epicurean style of writing. He hated the mere shell of the culture at Tokyo, and 'Taigyaku-jiken' (1910-11) gave him shocked, so he emphasized to turn back to the Edo culture; he wrote 'Udekurabe' (1916-17; the competition) that he drew the life in Karyukai (the world of Geisha), and 'Okame-sasa' (1918). His works 'Tsuki-no-ato-saki' (1931) showed his special to describe the life in common. During the world war second, he had not worked, but he wrote some stories of 'Fuchin' (rise and fall), 'Odoriko' (the dancer), 'Kunsho' (the decoration) and 'Raihousha' (the visitor) secretly, and he published them. 'Danchotei Nichijo' his diary he wrote since 1942 also published. Kafu moved to Ichikawa city in 1946. He was awarded Bunka Kunsho (the order of culture) in 1952. Shizue Kezuka is a Hiku poet from Ibaraki prefecture, She moved to Ichikawa in 1937. She remained many poems about Ichikawa and Nakayama. One of her haiku poem is carved on the stone tablet in the left picture. It stands on the way to the Shogyo-den near the Hoden-mon Gate..
Nakayama Hokekyouji Temple has a great accessibility from both Narita and Haneda International Airport. From Narita International Airport, take Keisei-line and get off Keisei-Nakayama Sta, take minimally 40 minutes from Narita Airport. And also take JR Sobu-exoress line, transfer the line at Funabashi to Sobu-Local line, get off Shimousa-Nakayama Sta.